When you grow up playing sports, chances are you are going to become a naturally competitive person -- and that will spill over in other areas of your life outside the playing field. All of a sudden, you’re adopting former NFL coach Herm Edwards’ philosophy of “Hello?! You play to win the game!” and losing a game of Trivial Pursuit is simply not an option (Or maybe that’s just me... It is? Okay, moving on). If I’m going to strike out, I want to go down swinging -- not with the bat sitting on shoulder as if it was stuck there with crazy glue. When (not if) I fail and fall flat on my face, I want to look back and see that I gave it everything I had until the final whistle. If I didn’t quit, didn’t shy away from the challenge, didn’t put in a half-effort, I could walk away with some kind of peace. Even then, failure will sting -- but you can walk away from it without any regrets. It’s easy to be a good sport after getting the big win, the promotion with the killer pay raise or when life is going great. After failure? Not so much. Emotions are running high -- and we’ve all seen plenty of post-game handshakes turn into shoves and punches on national television. Ephesians 4:26-27 says “don’t sin by letting anger control you... Don’t let the sun go down while you are still angry, for anger gives a foothold to the devil.” We have to fight to let anger and bitterness go (still working on this in my own life). We have to -- or it will end up consuming us. It's our choice. In the aftermath of failure, don’t do anything or say something that you’re going to regret later. Be gracious. Stay thankful. Hold your head high and keep moving forward. Don’t let bitterness take hold of your heart -- it’s not worth it. Some failures feel like the end of everything. Some mistakes feel like they’re too big to be forgiven. But they’re not -- they only seem that way when we’re stuck in the middle of it. In Proverbs 24:16, it says “though a righteous man falls seven times, he will get up.” Even the “righteous” mess things up every now and then, yet there is still grace! There is always grace. There are still chances to get up and start over everyday. Don’t let failing and falling keep you down. Don’t let it have the last word. Don’t let it define you. We fail, but that doesn’t make us failures -- that makes us dreamers and doers. It was (and is) those failures that equipped me to handle everything that comes with successes both small and great. 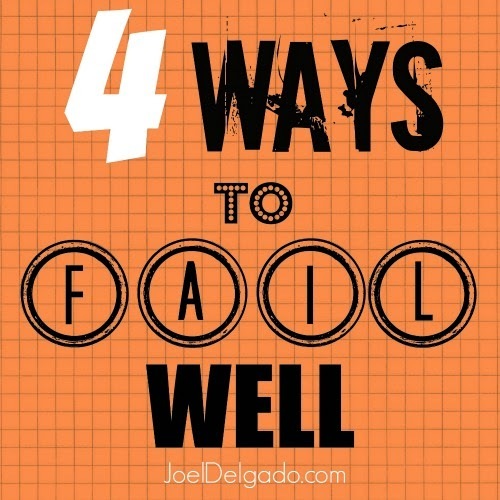 We can't hide from failure, but we can learn to fail well -- and failing well can make all the difference.